Thanks to Alice for the question about Daechu (Korean dates). 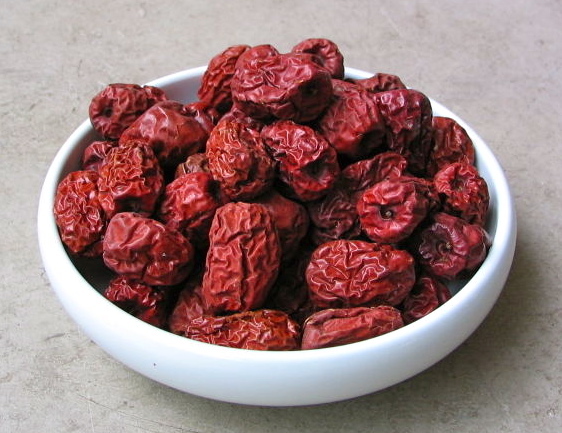 I’ve been thinking of daechu all morning now, and I’m really inspired to get some dates and cook some food that has daechu in them. Oriental medicine uses Korean dates for soothing the mind and body, protecting the five main organs and promoting kidney health. You really will see Korean dates included in all sorts of different oriental medicine! The six main medicinal purposes of Korean dates that are well know are: 1) Protects the kidney, 2) soothes and strengthens nerves and the mind, 3) helps with appetite, 4) prevents the body from aging 5) helps with urination, and 6) promotes a healthy reproductive system. Culturally, Korean dates are a symbol of longevity and prosperous offspring due to these medicinal purposes. So they are always used as a very important part of the ceremony in Korean traditional weddings. Bill and I had them in our Korean wedding of course. It’s also a huge part of Korean thanksgiving, and we always have it on our table for honoring the ancestors for thanksgiving. We serve dates both raw and dried at thanksgiving. Kids (and adults) love to munch on it. Koreans like to eat it raw when it’s slightly green, or when it’s all ripe and brown. It’s crunchy and crispy and delicious. We also dry it – and eat it as a dried fruit, put it in medicine, put it in jjim (steamed dishes) or tang (stews), or desserts (such as yakbap – has dates, chestnuts, rice, cinnamon etc.). We also make tea out of Korean dates as well. I love all of these dishes; they are all so yummy! There are different kinds of Asian dates though. The Korean honey dates are what Koreans use mostly – originally from the region of “Bo-eun” in Korea. They are very high quality and taste very good and sweet. I’ve found that the kind I get from Asian grocery stores sometimes do not taste the same, even when they look similar. But when you get the right kind, they are delicious! Hopefully, I’ll get a bag soon and have a recipe to share as well! ← Korean Show “Animal Farm” Brings Animal Rights Mainstream! Hi, Sunnie. 🙂 Thanks for the pictures and info! Are these the same things that are always referred to as “jujubes” in Korean cookbooks? Yes. I’ve seen them referred to as jujubes too. I know, the health benefits of deachu are awesome! Thank you for this post. I am going to see if I can find good dates at the Korean market. I was happy to discover that my favorite Korean restaurant (and in my neighborhood) uses non gmo, locally grown soybeans to make their tofu. I am going to refer them to your site as well.